The 508-SW is a smart multi-channel displacement, gap and bore measurement amplifier at about half the cost of the current amplifier. This new Capteura® multiple channel switching signal conditioner does not sacrifice the very high linearity & stability advancements of the real time system. Compatible with all Capacitec Probes, the 508-SW can switch up to 8 channels for use in displacement, gap and bore applications. 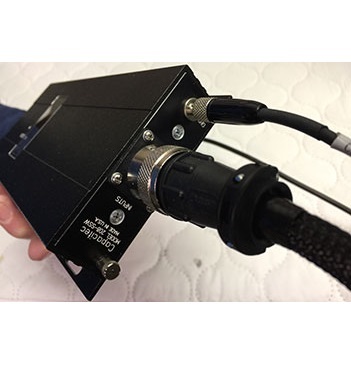 It is ideal for slower speed multi point measurement applications for displacement up to 8 channels, gap measurement up to 4 dual gap sensors and bore probes with 4 differential locations. The 508-SW is housed in a small rugged aluminum enclosure with an external envelope of 9.5″ X 4.25″ X 1.25″ (241mm x 108mm x 32mm). This compact switching configuration is ideal for a large number of industrial applications such as multi-point gap alignment measurements for jet turbine manufacture, parallelism tools and single amplifier set for several different gap probes used to measure slot die coaters. The system offers a USB Type A serial port connector or an optional Ethernet J45 interface module. It communicates measurements to a PC or PLC controller. This avoids the additional cost of an external 18 bit A/D converter card or module. Customers can integrate the 508-SW module’s linear data string into their in-house software program for in-process measurements and quality control. Stay tuned for the Capacitec soon to be released 516-SW – a 16 channel switching amplifier. Make Enquiry For Product "508-SW Multiple Channel Switching Amplifier"